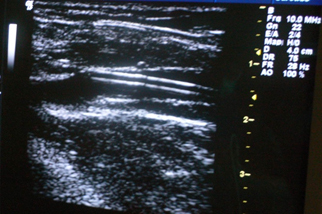 In phlebology, endovenous laser treatment (indicated with EVLT or ELT – which stand for Endovenous Laser Treatment or Endovenous Laser Therapy) is the most recent surgical procedure for photocoagulation of the small and the great saphenous vein: it is an outpatient procedure that is extremely effective and safe for the treatment of saphenous and secondary varicose veins insufficiency. For lower limbs endovascular surgery, the use of the diode laser QuadroStarPRO is a viable, quick and minimally invasive alternative to saphenectomy or surgical stripping. Compared with other surgical treatments, EVLT or EVLA (Endovenous Laser Ablation) has many advantages for the treatment of incontinent saphenous vein: it is an outpatient procedure done in a very short time and requires only local anesthesia. It reduces complication rate and possible side effects such as inflammation and hematoma. The non-removal of the saphenous vein and the small size of the scars greatly favour the post-operative course, reducing pain, discomfort and recovery time. Once the vein mapping is performed using the echocolordoppler, and tumescent local anesthesia is injected, the fiber optics (which carries the laser energy) is inserted in the saphenous vein with ultrasound guidance applying a very thin flexible catheter. 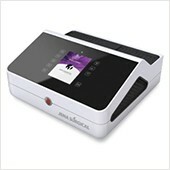 Contrary to other more invasive procedures, the laser treatment involves a small incision usually at the knee level. During the procedure, the fiber is made to move progressively backwards while releasing laser energy, causing a photocoagulation effect from the inside of the vein itself. The blood vessel walls collapse blocking it completely, thus isolating the saphenous vein from the circulatory system without needing to remove it. 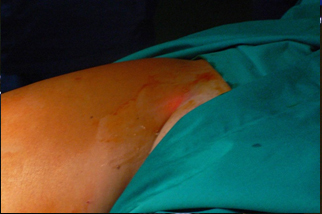 After the procedure, the patient treated with QuadroStarPRO is dressed with a compression bandage for a few days. He/she can walk immediately and resume normal daily activities within a short time. (A): The ultrasound image shows the angiographic catheter placement in the cross. (B): transluminescent effect of guide beam before starting treatment.